The Hollandaise sauce takes this roasted asparagus dish over the top. Toss asparagus with 1 tablespoon ghee, salt and pepper and roast until it starts to caramelize but is still crisp, about 10 minutes. Add egg yolks, lemon juice, and cayenne pepper to blender and blend a few seconds until combined. With blender running, pour hot ghee or butter into blender in a slow steam until combined. Taste and add more lemon juice, cayenne pepper and salt if needed. Thin with a little warm water if desired. 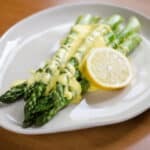 Drizzle Hollandaise sauce over asparagus and serve remaining sauce on the side.